Custom regions are a simple concept with huge potential for improved data analysis, tailored just for you. Use Avantalytics' powerful custom region builder to quickly set up regions that are specifically meaningful to your business. 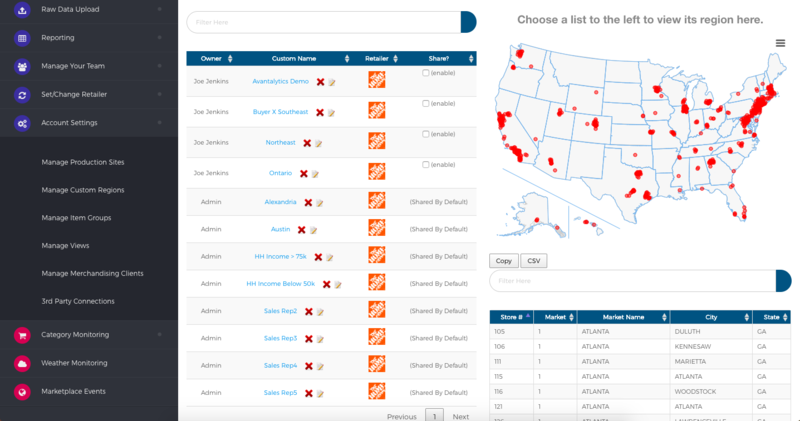 Custom regions, simply put, are collections of retail store locations, specific to a retailer. Imagine if you are introducing a new product in a small set of stores and want to monitor sales of stores. You need to report on just those stores. Or perhaps you have a number of field sales people with different territories and you wish to report on each specifically. There are hundreds more scenarios, but lets get to the meat! Just as markets, or districts, or patches are just arbitrary groups of stores, Avantalytics allows you to create and name and manage and share custom groups of stores. You can view several custom regions at once by holding down your "Ctrl" key and selecting multiple regions from the list? Try it out (shown below).